BodyHoliday, St Lucia is set amongst 32 acres of lush gardens and nestled at the edge of a beautiful and secluded beach, BodyHoliday is a true haven of relaxation in the north of St Lucia. Part of the exclusive Cap Estate, the hotel is one of the most famous spa resorts in the Caribbean, with a huge range of complimentary treatments and sports on offer to its guests. The resort also serves up delectable cuisine to suit everyone’s taste with a number of restaurants and bars to choose from. A true all-inclusive resort that is simply unrivalled in terms of its facilities, service and food, with the spa and restaurant winning awards from the likes of Conde Nast. Build on the philosophy of the four basic principles of relaxation, restorative beauty, exercise and good diet which will ensure you leave relaxed and recharged. 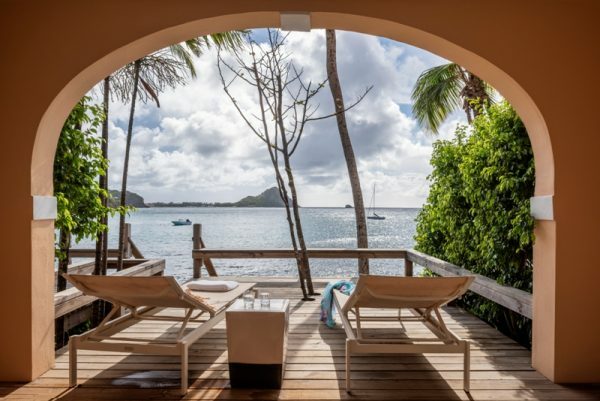 Bodyholiday is one of the foremost private and luxury retreats on the island, and indeed in the Caribbean, and their motto is something that is brought to life throughout the hotel – “Give us your body for a week and we’ll give you back your mind’. All of the rooms at BodyHoliday are your own personal sanctuary, a place you can retreat to and relax in. Each is beautifully appointed to give you that feeling of comfort and luxury. 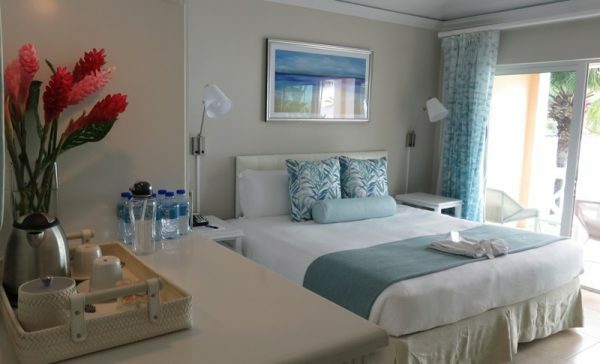 Amenities as standard include air-conditioning, direct dial telephones, ipod docks an clock radios, safe, private bath or shower, dual 110/220 voltage, a range of toiletries, complimentary robes and internet access with WiFi and wired ports. WiFi is also available in the lobby, games room and library. 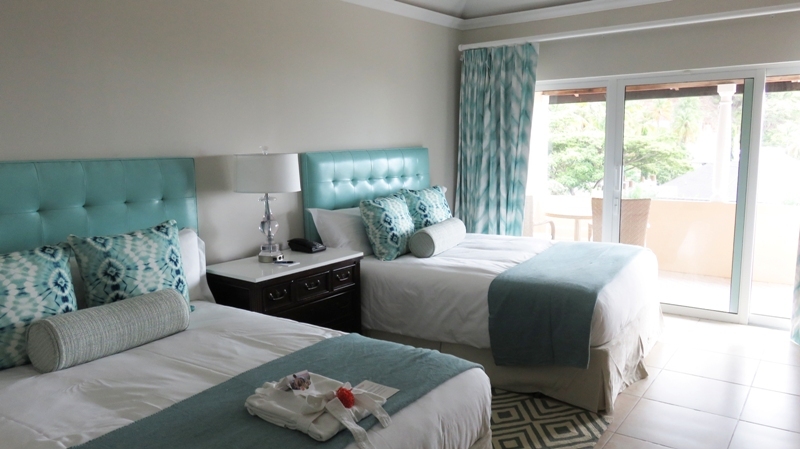 Garden Room – These rooms are ideal for single travellers and are both spacious and beautifully furnished. There are lovely views out over the gardens and no supplement charges. They would also suit teenagers whose parents are staying elsewhere in the hotel. They sleep 1 person in a queen size four poster bed. Luxury Room – Located in an elevated building with views over the gardens and feature an array of beautiful mahogany furnishings and a modern bathroom with full-body jet showers. The balcony or terraces are spacious and come with wicker chairs and dining table. 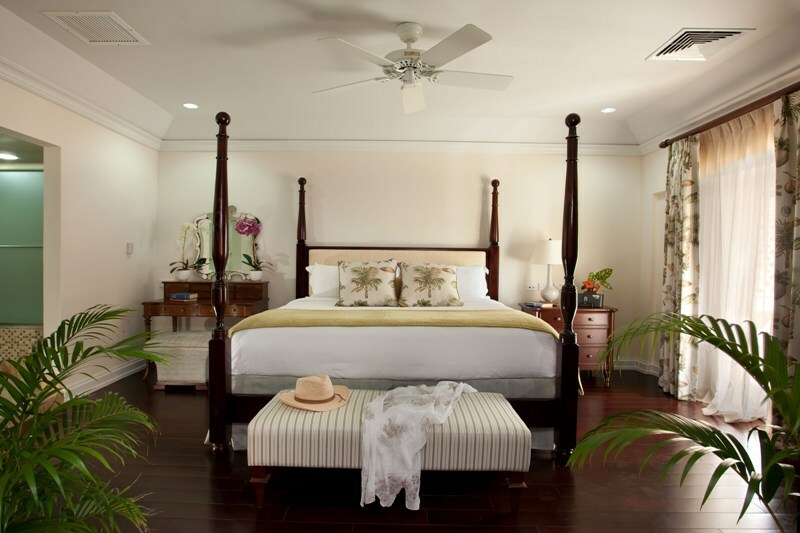 They sleep up to 3 people in a king size four poster bed or two queen size beds. 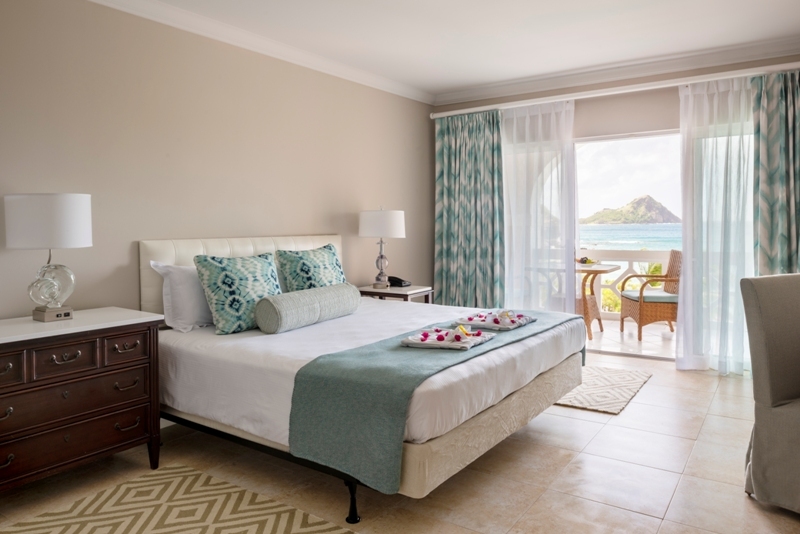 Luxury Ocean View Room – These rooms have a similar positioning, style and feature set to the Luxury Rooms but now the views extend out over the sparkling Caribbean Sea for you to truly enjoy the beautiful island landscape. 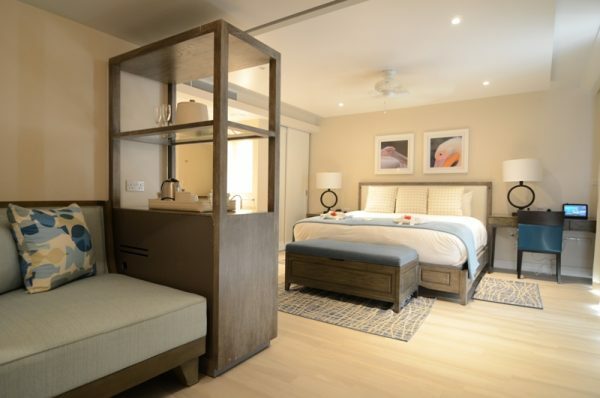 They sleep up to 3 people in a king size four poster bed or two queen size beds (two queen sized beds are subject to available and cannot be guaranteed). Luxury Ocean Front Room – With its sea-adjacent position you can hear the waves breaking below your balcony. 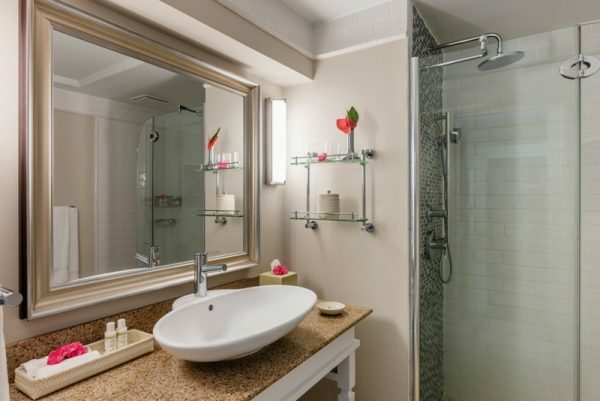 Decorated to a luxurious standard with a large bathroom complete with dual sinks and vanity table along with a full-body jet shower. On the balcony there are wicker armchairs and footrests along with a coffee table. They sleep up to 2 people in a king size four poster bed. 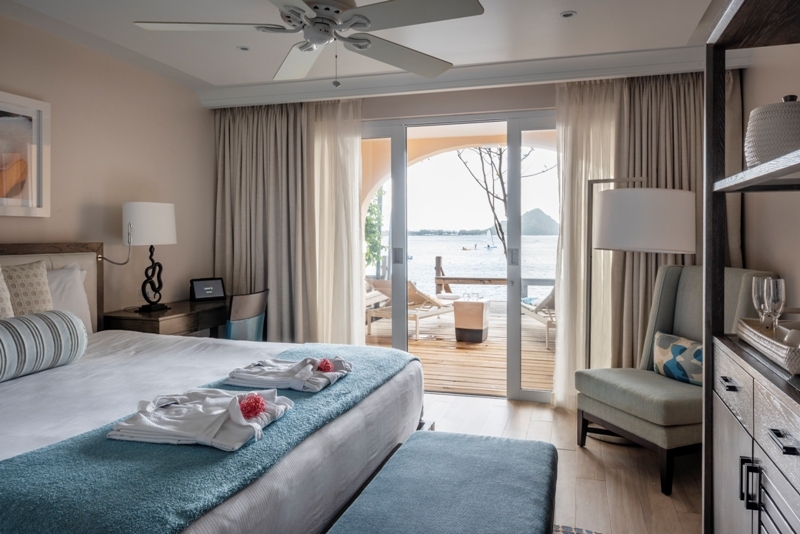 Grand Luxury Ocean Front Room – Offering striking views out over the Caribbean and adorned with dark wood furnishings as well as a large marble bathroom with bath/shower and vanity table. 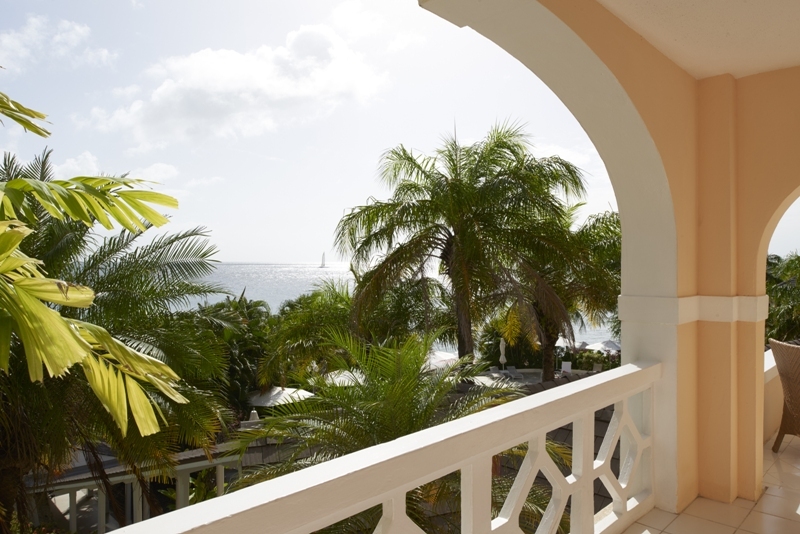 The spacious and furnished balcony is great for admiring the view. They sleep up to 2 people in a king size four poster bed. Grand Luxury Ocean Front Junior Suite – One of the most beautiful rooms on offer at the resort with similar furnishings to the standard Grand Luxury Ocean Front room but with a spacious separate sitting area for your enjoyment. They sleep up to 2 people in a king size four poster bed. 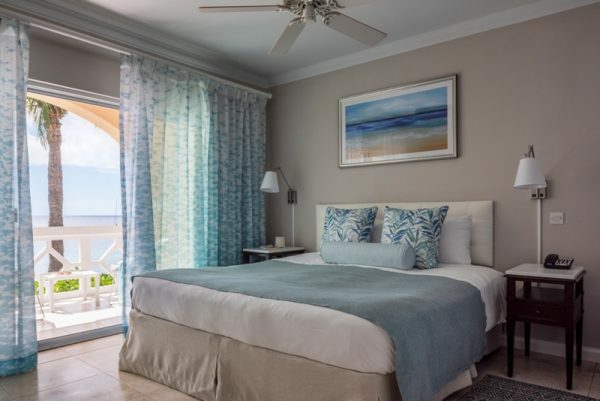 Grand Luxury Ocean Front Suite – Located on the second floor of the sea adjacent building, these lavish suites have a master bedroom and separate spacious sitting area as well as a double balcony with loungers and a table. 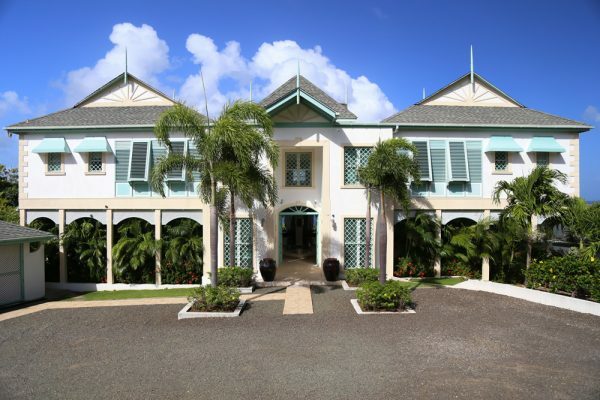 There is marble flooring, a wet bar and entertainment centre for you to enjoy. They sleep up to 2 people in a king size four poster bed. The Penthouse Suite – The penthouse suite sits at the very top of the hotel. An open-plan arrangement with living area with wet bar, master bedroom and lavish bathroom with a tub for two. The centrepiece of this incredible suite is your own private spa – with a heated marble massage bed, steam room, rain showers and an LED-lit dome ceiling. Truly an experience of a lifetime. It sleeps up to 2 people in a king size bed. 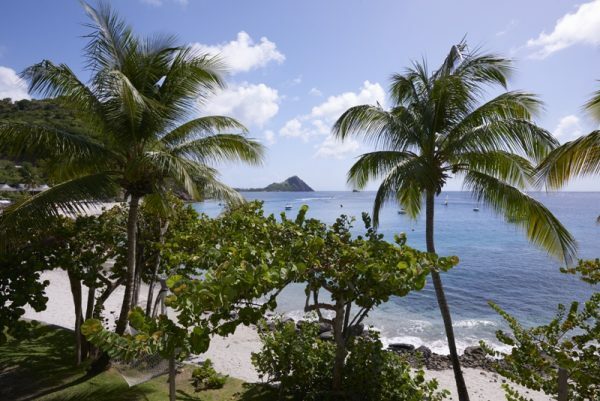 BodyHoliday prides itself in creating delicious and contemporary cuisine made with fresh island ingredients, all washed down with fine wines and enjoyed in spectacular surroundings. There is even a vegetable garden as part of the resort with to ensure the products are as fresh as possible. So whether you are dressed to the nines and sampling some exquisite fine dining in the famous TAO restaurant, or sandy and tucking into a sandwich at the beachfront Deli, we want to make sure you enjoy every mouthful. TAO – The highlight of the gastronomic experience at BodyHoliday and named as one of the “60 Hottest Tables” in the world by Conde Nast. With a AAA diamond rating it serves up an exciting fusion where East meets West, all with stunning views and an intimate atmosphere. Open daily for dinner 7:00pm – 9:30pm with a smart elegant dress code. Reservations are recommended. Cariblue Restaurant – With breakfast daily and themed lunches, the Cariblue is a great place to enjoy some great cuisine. In the evening the sea breeze cools you down as you enjoy a varied menu and extensive wine lists to the sound of soft jazz. Open from 7:30am with the last dinner seating at 9:30pm. Dress code is relaxed for breakfast and lunch and smart elegant at dinner. The Deli – Tucked away at the end of the beach the Deli beckons with excellent coffee and cakes, sandwiches, salads and juices, all with great views of the sun and the surf. Open 10:00am – 4:00pm with an informal dress code; just wander in off the beach! The Clubhouse – At the very heart of the resort, there is always something going on at The Clubhouse. At four there is a traditional afternoon tea service and come dinner time there is food served in the Pavilion, along with a great bar service. Afterwards there is often music and dancing, with an ever changing schedule of entertainment. Closing time is about 12:30am with a smart casual dress code. The Pavilion – Incorporating a buffet, grill and pizza station at the heart of the resort. The open kitchen uses only the freshest ingredients and the atmosphere is laid back. Open for lunch (12:00pm – 2:00pm), afternoon tea (4:00pm – 5:30pm) and dinner daily except on Wednesdays and Sundays (6:30pm – 9:00pm) with a smart casual dress code. The Piano Bar – A step back in time, the piano bar is both comfortable and relaxing with its array of antique furnishings and elegant style. The centrepiece is a white baby grand piano, with the pianist playing most nights of the week. The bar is air conditioned and open from 7:00pm daily, with a smart casual dress code. The Wine Salon – With such an extensive selection of wines on offer and a great emphasis on finding the perfect bottle to compliment your cuisine, the hotel now has the opportunity for guests to come in and sample a featured selection of wines, often paired with complimentary nibbles. This all serves as a great way of learning about different flavors and creating a more accessible experience. I-Tal- The I-Tal restaurant provides an incredible new farm to table dining experience overlooking the Coubaril Valley. This is a unique opportunity to discover the beauty of garden to table cuisine, inspired by their on site organic garden. Enjoy a guided experience whilst harvesting produce with the I-Tal chefs to create an unforgettable meal. The result is a spectacular vegan feast including incredible flavors and wholesome ingredients with a spectacular West-Indian view. 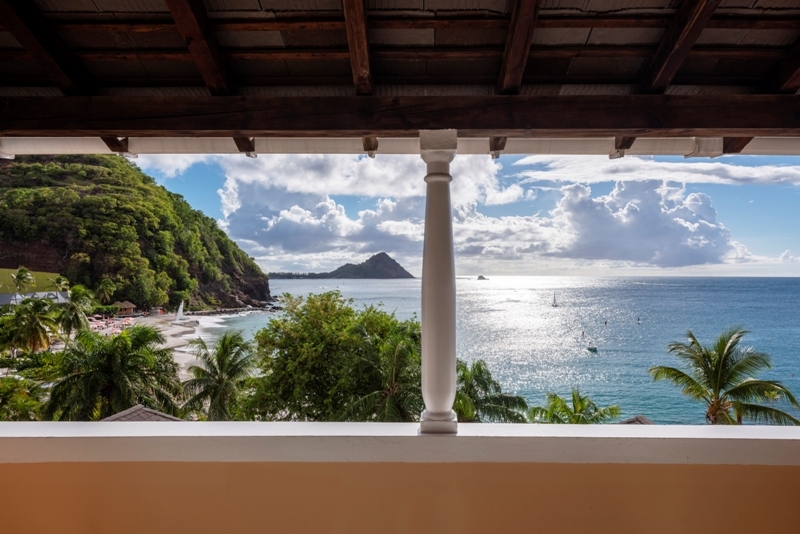 Naturally the beach and the sparkling waters of the Caribbean are the highlight and the focal point of any beach holiday in St Lucia, and it’s where everyone comes to enjoy the sun, the sand and the surf. 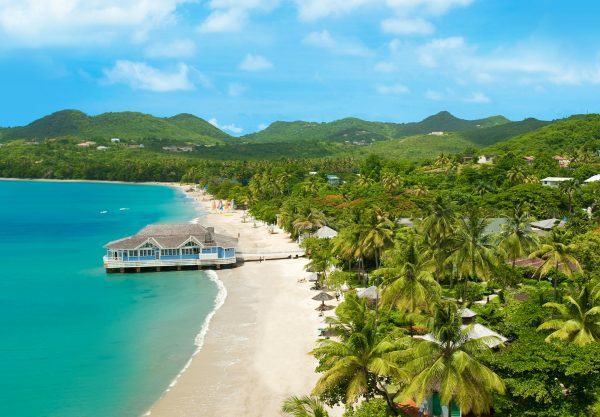 As part of the all-inclusive package at BodyHoliday you can enjoy snorkelling, scuba diving (beach dives complimentary, boat dives at a cost), water skiing and wake boarding, windsurfing, hobie cat sailing, kayaking and tubing. Back on land there are a huge array of things to keep you occupied including BodyAware (with additional packages at a cost), an extensive list of fitness classes and personal training opportunities at the health centre, yoga and pilates with daily sessions for beginners and experienced guests, daily Tai Chi, archery, fencing and volleyball. Tennis is included too with group lessons for beginner and intermediate levels as well as friendly matches arranged in a weekly competition every Tuesday. There is also private coaching available. For the golfers amongst you there are many opportunities for improving your game or even learning it from scratch with an on-site golf academy and two full-time PGA professionals. Complimentary lessons are available as well as additional sessions, analysis and rounds at the nearby 18-hole championship course at the St Lucia Golf and Country Club. There are also a whole host of exciting and adventurous tours and excursions to try out, speak to the concierge to find out more. A new addition to BodyHoliday lineup is the Quadrathlon – a competitive event comprising of a 10km bike ride, a 4km uphill run, a 100ft abseil, short swim and a 2.5km kayak back to the hotel. It is great fun and achievable by anyone with a good level of fitness, but spaces are limited to 6 people per week. From the start the philosophy of LeSPORT and BodyHoliday has been about four key aspects of life, and the wellness centre sits at the centre of this idea and concept. They have received many accolades over the years including “Top spa in the Caribbean”, “Second best spa retreat worldwide” and “Favourite overseas spa retreat in the world” from the likes of Conde Nast Traveller and the Spa Finder. Although immensely proud, they are always looking for ways of improvement. Their long and extensive list of treatments can now be browsed and a schedule pre-booked before you even arrive, meaning you can better organise your time while you’re here. Jive June – a whole month of dancing, with up to 16 classes a week covering everything from the Jive to Waltz. Wellfit Families – July & August is centred on the beach and includes a great range of fitness activities from weight training to cardiovascular, as well as basic first aid and CPR training from the resort lifeguards; get involved! September Solos – Perfect for those travelling on their own with dedicated events and classes, a great way to meet other like-minded guests. Octoba-Yoga – Emphasising the best of the renowned wellness centre, with spa treatments, exercise, fresh food and of course yoga. Great for beginners and enthusiasts alike! Pre-Xmas Restorative Break – Running from the 7th to 21st December, this is a great opportunity to not only prepare for the inevitable overindulgence during the festive period, but also to relax your mind and soothe your body. 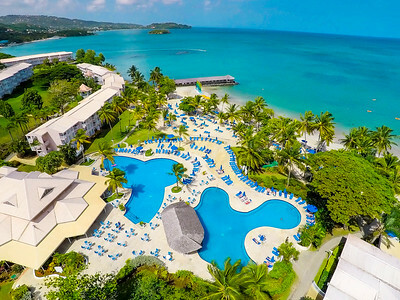 Bodyholiday prides itself in providing an unrivalled experience for couples and older children, and as such it is unfortunately not able to accommodate children under the age of 16 apart from at key times around the major school holidays – generally a month around Easter, three months for the summer and about 3 weeks in December. During these periods children over the age of 12 are accepted at the hotel. They are free to make use of certain activities at the hotel but there is no dedicated children/teens club available.